Oh man, talk about food for the soul. There's no way you can know how complicated life has become, infested with noise and chaos, until you've sailed a boat to a remote island with nothing there. No phones, no tv, no internet, nothing... Just you, beautiful white sand beaches, dolphins swimming around your boat, rainbows landing on the boat next to you and silence. It is then that you can remember and see the beauty our world has to offer. Ok, enough of the deep Tao insights. Here's my story and I'm sticking to it! We came back to the marina after our shake down cruise with some work to be done. We spent about a week and off we were. We headed up to Caleta Partida. An anchorage where we rode out a northerly for a few days. We were joined by S/V Friendship. The next day we headed up to a bay called Ensenada Grande, which was absolutely beautiful. We spent the day kayaking, snorkeling and hanging on the beach. Later that night we were joined by S/V Sojourner. We all ended up hanging out on Friendship for sunset. The next day Laura and I headed up to Isla San Francisco while the other boats went back to La paz. There wasn't much wind so we were motoring along when our oil light came on. (BUMMER) As Captain Ron would say " If it's gonna happen it's gonna happen out there" and it did. After we shut the engine off we raised our sails and started sailing. I called another boat Allure and Denny helped me figure out that our sending unit was broken. With a little plumbers putty, wire and some duck tape we were on our way again. I tried using gum but it wouldn't harden quick enough so I went with the plumbers putty. We got to San Francisco and spent 3 days there. We had Dolphins all around our boat, we hiked the island, did Yoga and Tai Chi on a secluded beach, met some great people and just had a blast. Another northerly was on it's way so we headed up to a little fishing village called San Evaristo, there we rode out the northerly. It was a great spot. We got some fresh fish from the local fisherman for about $1.50 for the whole fish. What a deal! After 3 days we headed back to Partida for a couple nights before heading back to La Paz for Carnival and to fix the oil sending unit. While in Partida we took our dinghy to the next cove where we had this beautiful white sand beach all to ourselves. 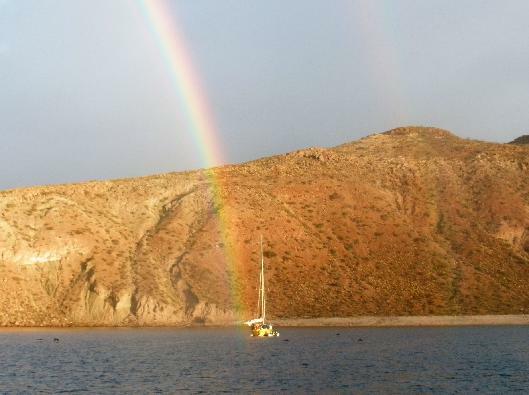 We'll be back in La Paz for about a week then we'll head back out to the Islands and further up into the sea. Enjoy all the pics!